It’s a presidential election year and mobilizing potential voters, especially young ones, is an important activity. 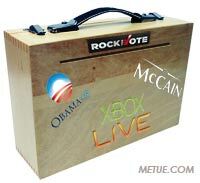 To advance the cause, youth centered voting activist organization, Rock the Vote, has creatively partnered with Microsoft’s Xbox Live online gaming community. Beginning Monday August 25, the first day of the democratic National Convention, Xbox LIVE members will be able to register to vote, share opinions, interact and participate in polls through the console community. While we’ve covered some clever nontraditional uses of game consoles before, this has to rate near the top of the list. It is up there just slightly behind using Wii controllers for robotics or Stanford’s groundbreaking Folding@home molecular research project. Heather Smith, executive director of Rock the Vote explained the partnership in a press release saying: “Xbox is a natural partner to help us reach out to youth voters.” The non-profit’s goal is to get 2 million young Americans to register to vote. “We need to go where young Americans are, and there’s no doubt in our minds that many are on Xbox 360 and Xbox LIVE,” she added. As a form of social-network connected through the Television and game console, Xbox Live reaches an audience of 12 million. Microsoft colorfully notes in the press release that if this were a state, Xbox Live would be the country’s 7th largest. (If Microsoft ever ends up in another antitrust suit, that’s a boast they may want to forget). The hope is together the two organizations will be able to push some voters to the polls. Rock the Vote was founded in 1990 as a non profit, non partisan group aimed at engaging young audiences and drawing them into the political process with the help of music, pop culture and celebrities.